| Khader Adnan + Israeli Torture: ALL accountability Denied! He’s a legend in his own time. Global human rights groups, activists, and many others support him. His extraordinary courage demands acknowledgement and recognition. Obama and officials in his administration did nothing to help him. Israel’s media took note. American media scoundrels barely notice. He’s attracting world attention. He’s Palestine’s Bobby Sands. Major media scoundrels ignore him. His story begs to be told, but they’re largely silent. “His plight is sparsely covered in the US corporate media…” Instead they cheerlead war and party while imperial America ravages the world one country at a time. In contrast, supportive groups and alternative media champion his heroic struggle. Israel wants him dead. Supporters won’t stay silent and resist. The whole world’s watching, but you never know it following US television and print media. His brief article was accurate to a degree but ignored the plight of Palestinians under nearly 45 years of repressive occupation and 64 years since Israel stole their country. Adnan’s their symbolic hero. He’s willing to die for justice. That’s courage few anywhere can match. Now 65 days and counting, Physicians for Human Rights-Israel (PHR-I) says “fast(ing) in excess of 70 days does not permit survival.” On February 19, a joint PHR-I/Addameer Prisoner Support group statement said Israel’s High Court will hear his petition on Thursday, February 23 at 11:30AM. On Monday, Israel’s Supreme Court rescheduled Adnan for Tuesday without explanation. He’ll be on day 66. PHR-I provided a detailed medical report. It explained his “immediate danger of death.” Both groups expressed great displeasure that despite his condition and world activism on his behalf, Israel’s High Court delayed his petition hearing. Now they moved it up. Perhaps it’s still too late, and consider the problem. If they don’t rule favorably post haste, it won’t matter. If they do and order his immediate release, Israel’s prison authority may appeal or delay. Israel’s hanging Judge Moshe Tirosh rejected his lower court appeal. High Court justices rarely override. Frustrated lawyers call the whole process oppressive. They want to help but can’t. Justice Israeli-style completely abandoned its role. Justices side with prosecutors. Decisions are based on “confidential security material” with little chance to review or challenge. Due process and judicial fairness are entirely absent. “The Israeli courts, whether directly or indirectly, provide a legal seal of approval for the acts of the occupation.” They’re complicit with state crimes against humanity. As a result, Palestinian lives are lost. Only Jewish ones matter. “(D)ue to his medical condition, (he) can no longer uphold the ill-founded allegations that (Adnan) poses an immediate threat to the security of the Area or public security of the State of Israel; therefore, continuing to hold (him) is prima facie a violation of international law and Israeli law and amounts to arbitrary law” and a death sentence. So far, no response was forthcoming. “Addameer and PHR-Israel condemn the fact that the government of Israel continues to deliberate inaction and delay in disregard of the urgency of (Adnan’s) case. Addameer and PHR-Israel hold the government of Israel accountable for” his life. Both groups called on international communities to exert immediate pressure on his behalf. Weasel words won’t help. Strong condemnation of Israeli lawlessness is demanded now. From his hospital bed, he said he’s “confronting the occupiers not for my sake as an individual, but for the sake of thousands of prisoners who are being deprived of their simplest human rights while the world and international community look on” dismissively. He’s doing it for all Palestinians under oppressive, illegal occupation for decades. On February 20, the Al Mezan Center for Human Rights condemned Israel’s barbaric treatment. Prisoners resist their only way by refusing food. Dozens of previous hunger strikes occurred. Adnan did earlier when detained. Palestine’s illegally occupied. Palestinians are arbitrarily detained. Thousands are currently held and tortured, including 25 Palestinian Legislative Council (PLC) members for belonging to the wrong party. Inadequate amounts of poor quality food are provided, and many detainees are isolated repressively in solitary confinement for extended periods. “Al Mezan reiterates its previous calls on the international community to intervene to end Israel’s systematic and grave abuses against Palestinian detainees” and demand Adnan’s immediate release. Thousands of Palestinians rallied in support. So did hundreds of prisoners going on open-ended hunger strikes. Harsh punishment followed, including isolation in solitary confinement. Adnan’s wife Randa fears the worst, but clings to hope he’ll be saved. She’s enduring best she can. Five months pregnant, she has two daughters. She’s been outspoken for her husband. She deplores the lack of objective reporting, including misstating what she says. He’s been detained eight previous times. Since 1967, over 700,000 Palestinians have been imprisoned. They include about 40% of Palestinian males and thousands of women and children. Most are political prisoners. Their crime: praying to the wrong God in a Jewish state. As a result, Israel calls them terrorists. We’re all Khader Adnan. His struggle is ours. Yet it’s systematically practiced by Israel’s Police, Israel Securities Authority (ISA), Israeli Prison Service (IPS), and Israeli Defense Forces (IDF). An earlier 2009 PACTI report discussed the practice and systematic disregard of hundreds of complaints filed from 2001 – 2009. No investigations followed over 700 earlier complaints filed. Israel whitewashed and forgot them for two reasons: “either denial or justification under the necessity defense doctrine,” even though international law prohibits torture at all times, under all circumstances, with no allowed exceptions. No matter. Lies substitute for truth, full disclosure and justice. They’re not in Israel’s vocabulary. Instead, statements like: “There is no basis for your complaint” are common. No documentation accompanies these type responses. As a result, systematic coverup and lies are compounded. Victims bear the burden of proof. Their version of events are denied. Absent independent inquiries, justice nearly always is denied. Nonetheless, pursuing all possible avenues, PACTI filed five High Court of Justice petitions on behalf of 26 victims. Each endured especially harrowing physical and psychological torture and/or ill treatment in the course of Israeli Security Authority (ISA) interrogations. (1) By law, the AG must refer all torture complaints to proper authorities. (2) Requiring additional corroborating evidence assures whitewash. Physical and psychological scars aren’t enough. As a result, torture nearly always becomes an “evidence free” crime, excluding the possibility of justice. (3) AG actions violate the responsibility to investigate all torture complaints, as established under international law. “Necessity defense” justification accounts for about 15% of PACTI complaints since 2003. The landmark High Court 1999 ruling banning most torture methods determined that “necessity” doesn’t constitute sweeping a priori authorization for “physical” interrogations. At the same time, it established a huge loophole, empowering the AG to devise guidelines for treating “ticking bomb” cases. In other words, extremis exceptions lie in the eyes of beholders to define as they wish. As a result, torture and ill-treatment got de facto approval even though international law is firm. Israel circumvents it and its own. The most egregious practices follow. PACTI says necessity doesn’t abrogate Israel’s obligation to investigate when reasonable grounds cite torture. On February 15, PACTI petitioned on his behalf. The case involved ISA agents admitting they acted contrary to approved procedures by staging a hoax to extract a confession. Sweiti was told his wife and father were detained. As a result of subjecting him to extreme psychological pressure, Sweiti made repeated attempts on his own life. Psychological evaluation determined he suffered severe emotional harm. In response to the High Court Petition on his behalf, Israel disputes PACTI’s demands for a criminal investigation. It argued the complaint should have been requested initially. PACTI hoped possible changes might come in how interrogee complaints are examined. For example, in November 2010, Israel’s AG announced plans to shift ICC responsibility from the ISA to Justice Ministry. Nonetheless, he left critical issues unaddressed. Since April 2011, PACTI fruitlessly sought documents not provided. It wanted details on a possible policy shift. Finally, in late October, proposed plans were confirmed but not implemented. It suggests cosmetic ones only coming, not real accountability. The clearest information on Israel’s ISA accountability comes from Deputy State Prosecutor Shai Nitzan’s testimony before the Turkel Commission. It was established to whitewash the May 31, 2010 Mavi Marmara massacre. Defending current practices, he dismissed complainants as “interested parties (with a) basic resentment against the State of Israel.” As a result, they stand to benefit from submitting “frivolous” complaints. His attitude displayed dismissive arrogance. His rationale failed to address key issues. First, preliminary inquiries can’t, under Israeli law, comprehensively replace criminal investigations and don’t fulfill international standards. Second, legitimate complaints can’t be dismissed for lack of witness confirmation to interrogation torture. Finally, while torture and other ill-treatment don’t always leave wounds or other visible proof, PACTI research shows Israeli medical personnel failed to adequately document and report practices. Moreover, authorities prohibited independent medical evaluations until lesions healed. 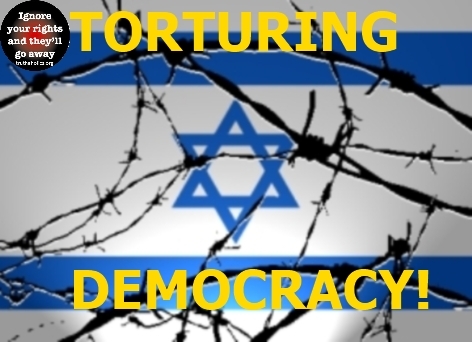 Israeli policy makers know what’s going on and protections in place for ISA torturers. Nonetheless, expect cosmetic measures at best ahead addressing them. Safeguards with teeth won’t be included. Israeli law enforcement officials spurn international law obligations. Sunshine’s the best way to expose them. Perhaps change will eventually follow. Israel’s had impunity for decades. It’s long past time that ended. Pressure alone may succeed. It’s vital to sustain it unflaggingly until what can’t be tolerated ends. This entry was posted in World and tagged human rights groups, human rights israel, mackey new york, palestinians and israelis, physicians for human rights, robert mackey by truthaholics. Bookmark the permalink.